A fortnight ago, Ximena and I and our respective partners J. and K., went to a bog where we picked various forest berries, including lots of lingonberries. The Latin name of lingonberries is Vaccinium viris-idaea, thus belonging to the same family with blueberries (Vaccinium Cyanococcus), bilberries (Vaccinium myrtillus) and bog bilberries (Vaccinium uliginosum). 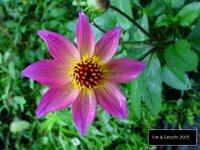 They're a great source of vitamin C, and have been appreciated by Northeners for that reason for a long time. 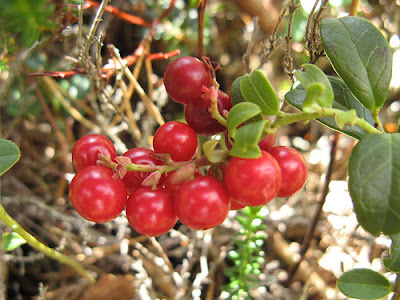 Lingonberries can be used to make apple pies and cheesecakes, rye bread and cream pudding, and a number of other desserts. Lingonberries are also great for making jam. 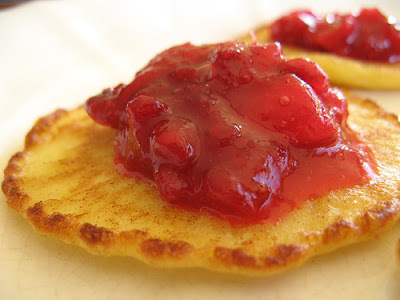 Lingonberry jam - at least the version here - has many uses. It can be used as a typical jam on pancakes, toast, breakfast porridge. But it's not overly sweet, and lingonberries yield this am a rather tart quality. Therefore it can be also used as a chutney to accompany grilled sausages or black pudding during Christmas. Pick through the berries to make sure they're clean. Bring water to the boil in a large saucepan, add lingonberries and simmer for 5 minutes, stirring, until softened. Add apple chunks and cook for 10 minutes, stirring frequently. Add sugar and simmer for another 10 minutes. Pour into hot sterilised jars and close immediately. * If it's a poor lingonberry year, then you can take 2 parts apples and 1 part berries. ** If using apples from your own garden or a reputable organic source, then you don't have to peel them. I used underripe "Valge Klaar" apples from my mum's garden. They're one of the earliest apples available and very soft and juicy, so they're perfect for jam-making. WHB: This is also my entry to the Weekend Herb Blogging, this time hosted by Zorra from Kochtopf (click through to read her round-up). I have to thank IKEA for introducing me to lingonberries (and a bunch of cool Swedish housewares, too). I love the taste, especially in savory dishes. Unfortunately I know just the dried version of lingonberries . ;-( Your jam looks delicious. I have never seen lingonberries in the stores here. Like Lydia said, if it was not for IKEA I would not even know they existed. Sad eh? LOL! The jam looks great Pille! I have never tasted fresh ligonberries, and like the others, only know them from IKEA. This looks wonderful, though!! I also haven't ever tasted lingonberries. (Salt Lake does have a new Ikea, so I'll have to look for them there.) Your jam-making skills are quite impressive! No lingoberries here either, but I brought a batch back with me from Sweden. When that's gone I'm heading to Ikea as well for my supply. Those pancakes look so delicious! I've had lingonberries...in Norway, I think, and loved them. I am a big fan of 'tart'. Your jam looks wonderful, vibrant color! I have never had these berries. Your jam is beautiful! wow, so many wild berries and i can imagine how wonderful they are to eat! i plan on go to lithuania in september and i hope the forests there will hold some interesting surprises! I have learned about lingonberries here with you. I wonder when I will have a chance to see them in the wild. Zorra - unfortunately (or luckily?) I've never encountered dried lingonberries in my life - only fresh or frozen. I like dried cranberries however, and use them often instead of raisins when baking. Kalyn - hope the new Salt Lake IKEA will have a "Swedish food corner", so you could find lingonberry jam. And jam-making is not difficult at all when you know the basics. I grew up with home-made jams and preserves, and definitely prefer them to industrial ones. Baking Soda - thank you! Katie - they're definitely 'tart'. Even if you add loads of sugar, they remain tart, which is wonderful..
Kristen - thank you! Hope you'll have a chance of trying lingonberries (and all other Nordic wild berries) soon! Kickpleat - I've heard good things about Lithuanian markets, so I'm sure you'll see lots of (autumn) berries. Ximena - thank you! It was so much fun forageing with you! Hehe, näedsa ja ongi sama retsept. Minu retsept tuli vanaemalt ja otseloomulikult ma vähendasin suhkru kogust :P Aga moos on ehe! I'm a lover of homemade preserves. When I couldn't find lingonberry jam this Christmas at the stores here, I got on-line and bought 4 lingonberry plants from RainTree Nursery. Can't wait to try them in this recipe! Many people think the cream could help to gain weight, but where you can add light ingredients in our recipes, the cream will fit in your diet perfectly, even the cream can help you to loss weight every time that you eat.